The Bach FH600 Flugel Horn is a fantastic instrument for the progressing performer who wants to take flugelhorn playing to the next level. The aristocrat model offers many of Bach's trusted techniques and specifications such as a 3rd valve tuning trigger, top quality stainless steel valves and a meticulously crafted 2 piece bell. 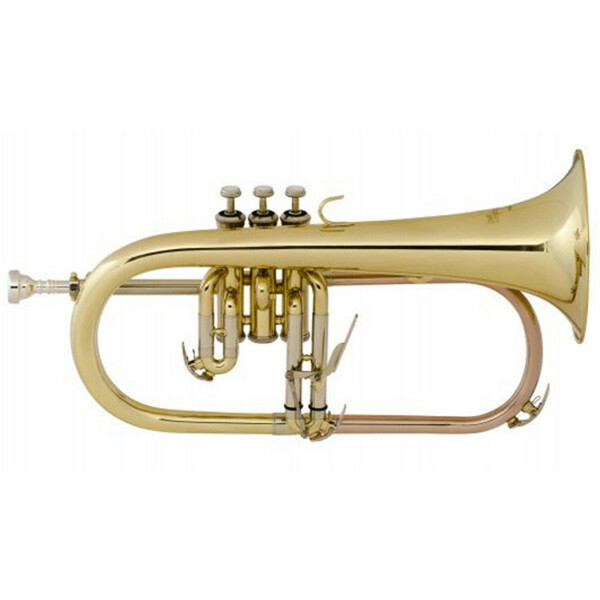 Included with the flugel horn is a case and mouthpiece, enabling you to play straight away. On this particular flugel horn, a two piece yellow brass bell has been used to give a responsive attack but with a lovely and warm sound. Rose brass has also been used on the piping to make the flugel horn extremely mellow, even in the low register that is often used for this instrument. A valve trigger has been used on the 3rd slide to improve intonation and tuning adjustments on the bottom register where the 3rd valve is used most often. Stainless steel valves have been used on the flugel horn to increase the longevity of the instrument and to prevent rusting and tarnishing. Whether this instrument is to be played in an orchestra, a jazz club or a brass band, the Bach FH600 flugel horn is perfect. It's beautiful and attractive tone make it an instrument that will blend in to any ensemble but it is also an instrument with a unique character for colourful and musical performances.